There is something magical about Switzerland. The combination of mountain peaks, cowbells, and hearing the Alphorn or perhaps it’s the Swiss chocolate. It’s not a lie that Switzerland is expensive, but we will share our tips to enjoying a nice weekend in Switzerland without breaking the bank. We enjoyed a long weekend holiday (Memorial Day for our American readers) and the end of May. The weather was stunning, and a perfect mix with the warm sun and cooling temperatures to enjoy various activities. 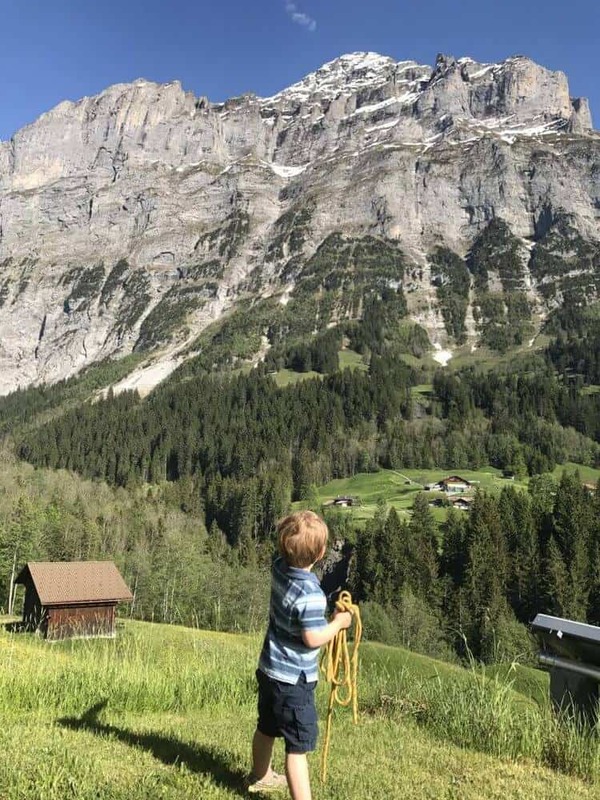 We were living in Stuttgart, Germany, so Grindelwald was a short 4-hour drive. The roads are maintained and easy to drive this time of year. 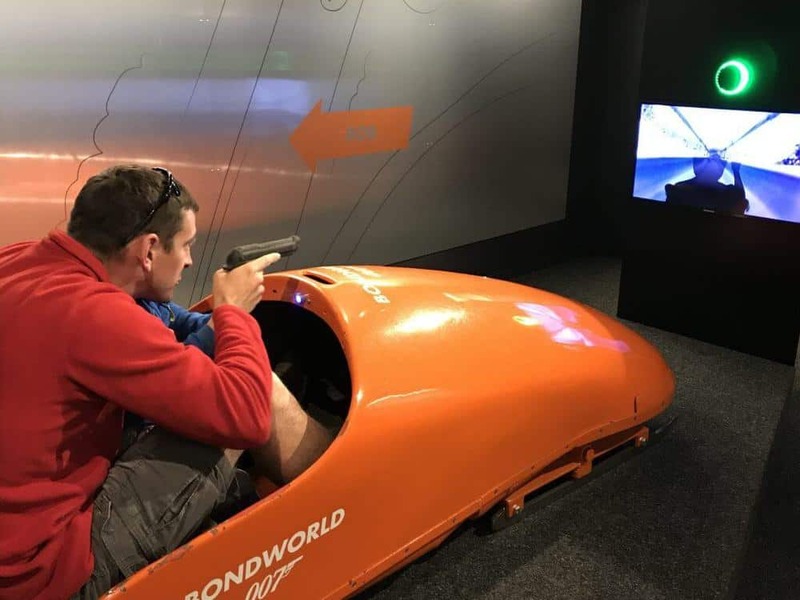 If you are visiting Switzerland, make sure you get a vignette before you cross the border. Check out more information about vingette’s here. We broke up the drive by stopping at Rhine Falls. 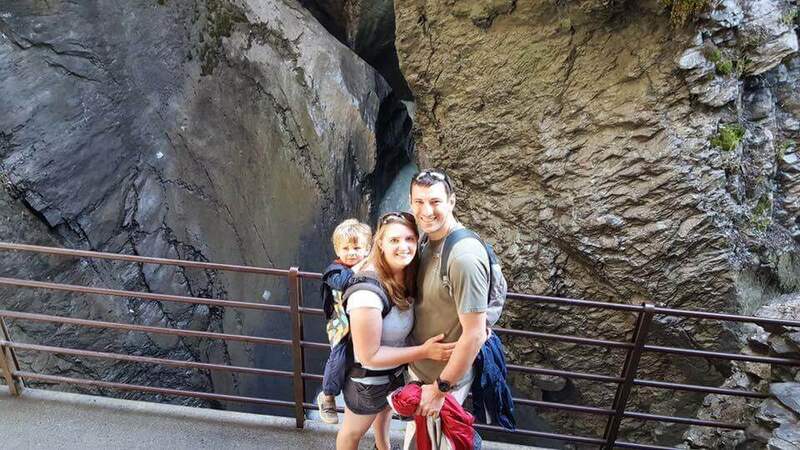 If you want to learn more about Rhine Falls, head to my post “Rhine Falls with Kids“. 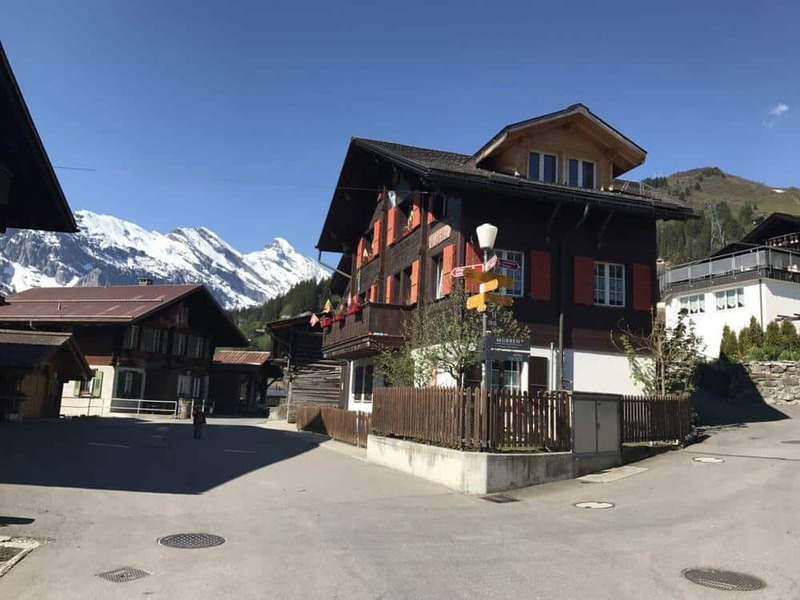 Where did we stay (Grindelwald Accommodations)? As we said before, Switzerland is expensive. When we started looking at hotels, we knew we would have to get a bit creative since $200-$300 per night wasn’t in the budget! 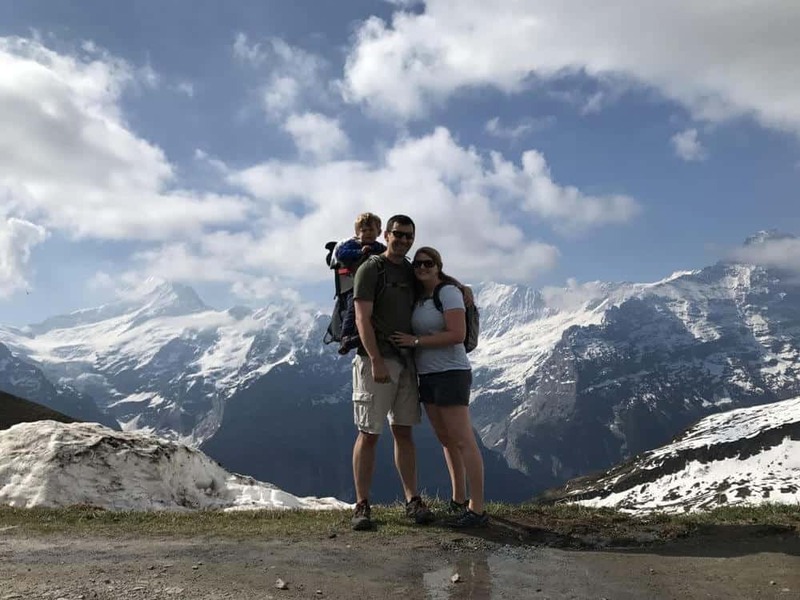 Since it is just my husband and I, along with our son (who was 2 years old at the time), we were able to share a one bedroom apartment located in the hills just down the hill from the main street in Grindelwald, Switzerland. Here is the link to the place we stayed from VRBO (Vacation Rental By Owner). The apartment was really cute and well appointed. It is the bottom level of the home with its own entrance and enough space for our family. We loved the views from just outside our door and its close proximity to the town. The family was able to provide a pack and play for our son. We did bring an extra blackout curtain (a trick we learned) to help make the living room dark. We slept in the bedroom at the back of the house. Views from just outside our apartment. We also picked Grindelwald because of its close proximity to Grindelwald First. 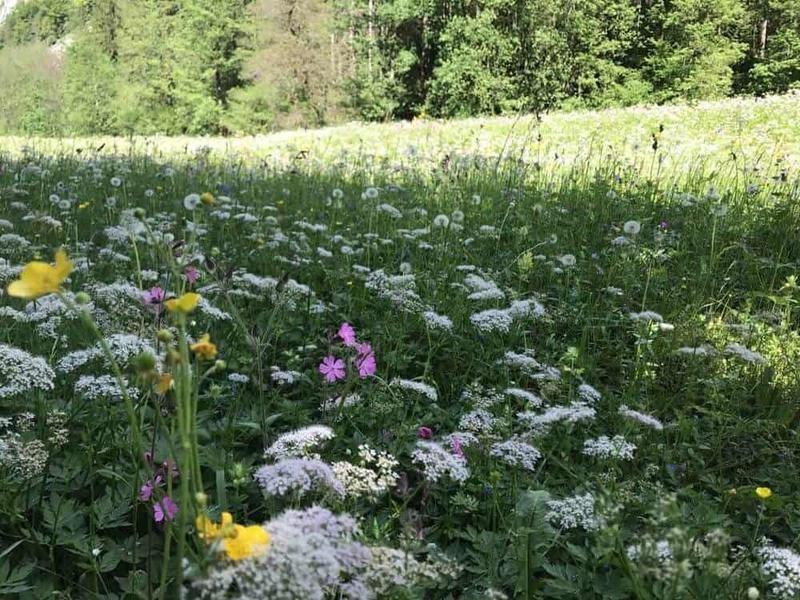 Another alternative is staying down in the valley near Interlaken or in a car free town, Murren (but you’ll have to haul everything up the cable car). How did we spend our days? 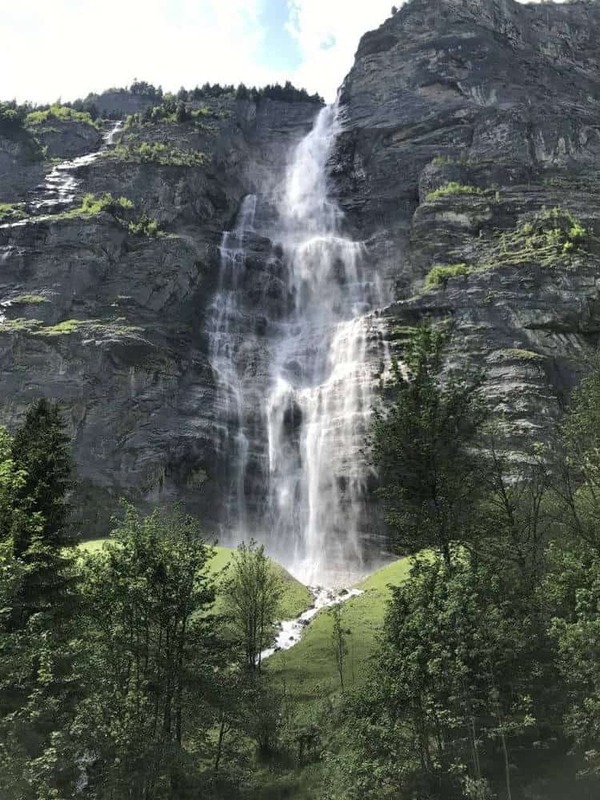 Day 1: Grindelwald First and Trümmelbach Falls. Day 2: Murren, Schiltthorn and Interlaken lake fun. 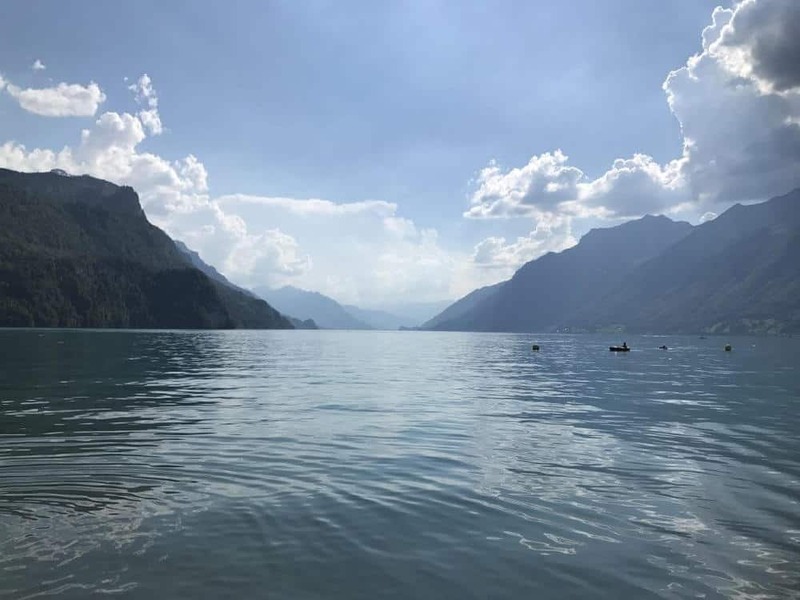 We spent a day driving into the area (with a stop at Rhine Falls) and a day driving back home (with a stop at the Lake Lucerne Transportation Museum). Want to read about our stops, click on the names and you’ll be directed to their pages, the Transportation Museum is coming soon! I’ll also share that our long weekend includes lots of laid back family fun. 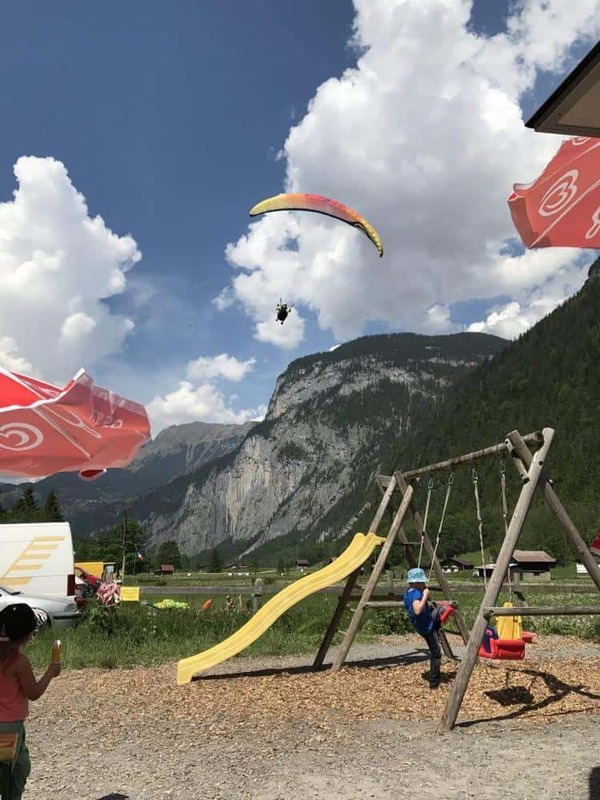 If we didn’t have a toddler we would be flying off the sides of mountains going paragliding, flying down the sides of mountains on mountain carts/rodelbahns (and if you don’t have kids, please do!) However, I’ll share lots of great tips for making it a memorable and fun weekend for families. TIP: It is best to head up into the mountains earlier in the days to help avoid the crowds. I feel like this is always my advice since “the early bird catches the worm”. Since we had a car, we drove into the town of Grindelwald and parked in the small paid parking area across from the lift. (When you enter the town, you’ll see signs for the list on your Left, the small parking area is on the Right.) Alternatively, you can look for limited street parking to find a place to park up in the neighborhoods and then walk to the lift. Purchase your lift tickets at the valley station and then you’ll take three lifts all the way up to the top. It takes approximately 30 minutes to get from the valley station up to the top. I suggest heading up to the top and then slowly working your way down. You’ll enjoy fewer crowds at the top and it will be easy to explore heading back down. 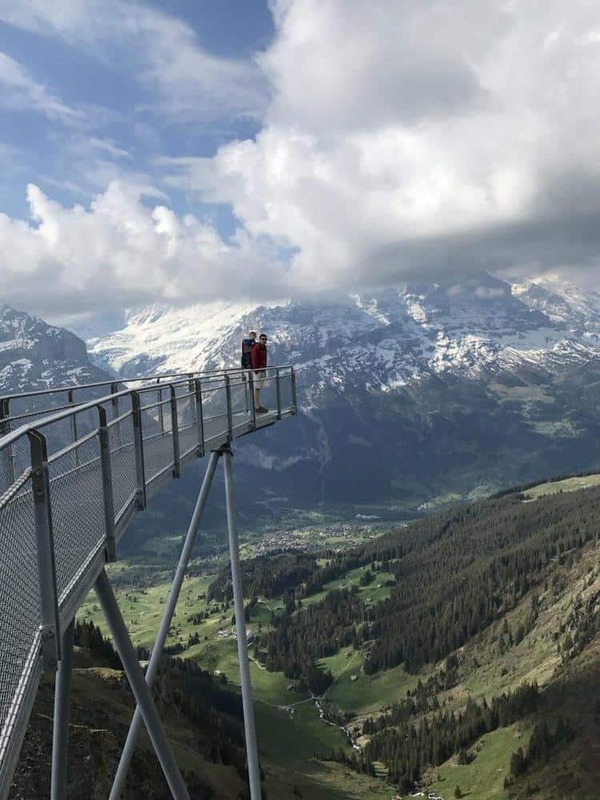 When you reach the top of Grindelwald First, take some time to enjoy the view from the observation deck or head straight to the cliff walk from the side. To reach the cliff walk, follow the signs around the left of the restaurant and observation point. The cliff walk is a ton of fun! It certainly isn’t for the faint of heart since your walking on an open platform attached to the cliffside. No one in my family has a fear of heights, so off we went (with our toddler running the majority of the time). This cliff walk is platform only with no obstacles. We will cover another cliff walk with fun obstacles later in our blog post. At the end of your walk, you’ll find a terrace that hangs over the valley and cliffs below! 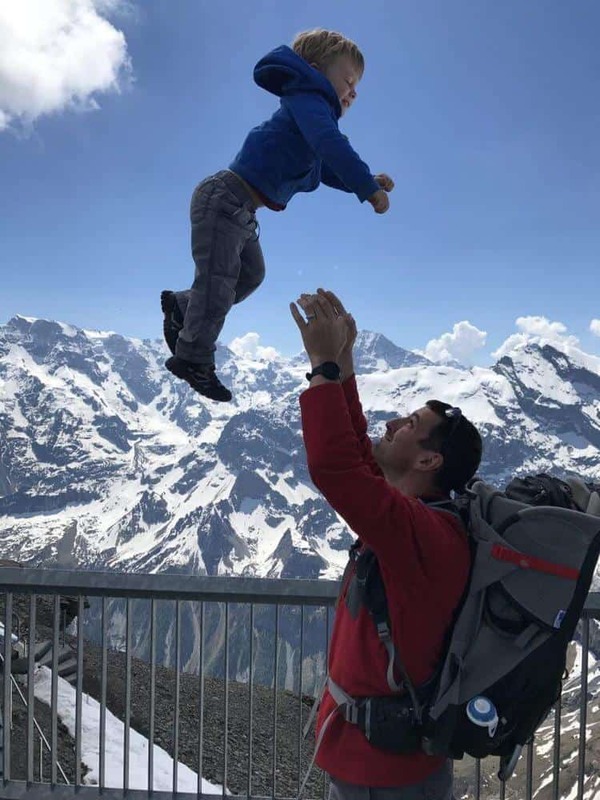 See if you can trade off with another family to get an amazing photo or if no one is around then it’s just my husband and son. After our walk, we grabbed a quick snack before heading out on a hike. 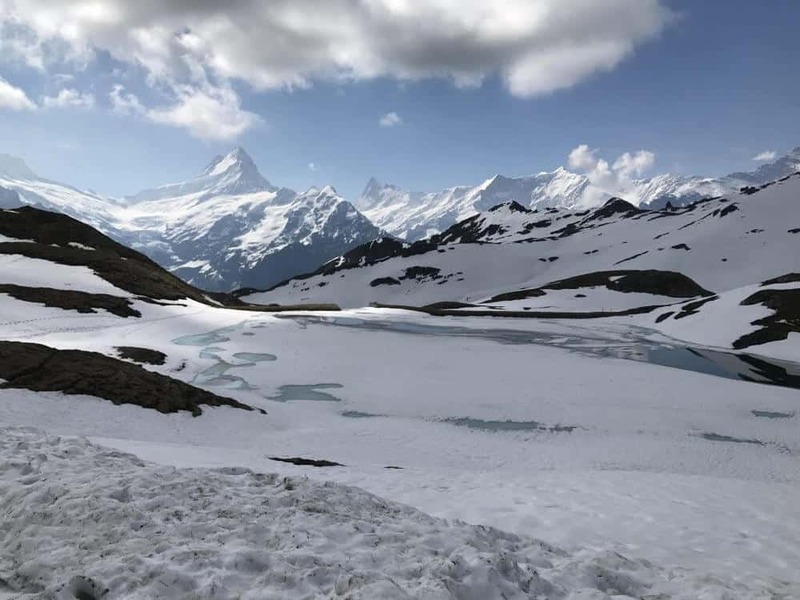 I did a ton of research and decided we wanted to hike from the top of Grindelwald First out to Lake Bachalpsee and back. It is about 2.5 hours round trip, so make sure you have the right gear and snacks. In late May, the hike wasn’t easy. There were periods of the trail with gravel, ice, and snow. It is also not flat terrain, instead of with sloping hills. Be sure to have proper footwear and I wouldn’t choose this trail with young children (unless you have a kids hiking carrier like we brought). We did see an Asian family attempting the hike with a stroller, but it looked pretty intense! You can see the views were not as amazing as we hoped because the lake was still partly frozen. I’d highly recommend the hike in the summer months to enjoy the beautiful crystal clear blue waters. After our hike, we headed into the Grindelwald First restaurant to enjoy lunch. We thought the food was really good, even though it was pricey. We continued to enjoy the views before heading down. 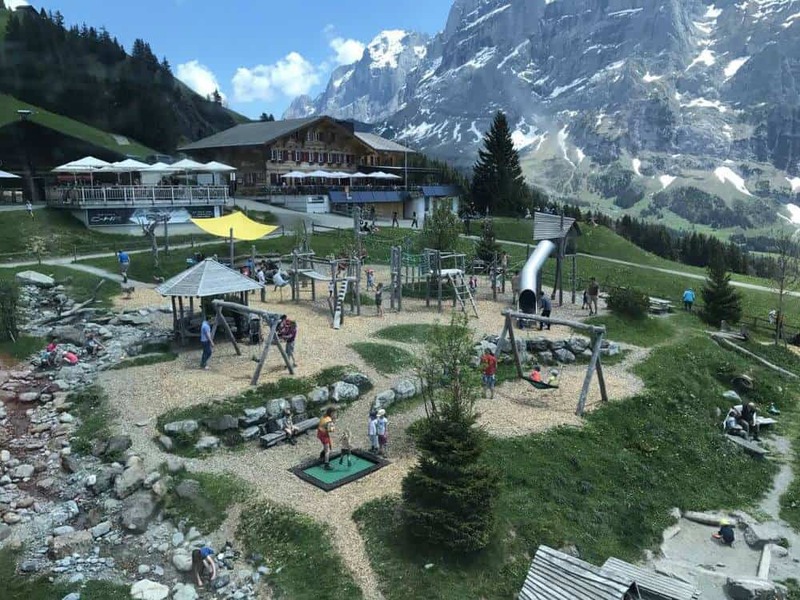 One of the fun activities at the top of Grindelwald First is the zip line (First Flyer). 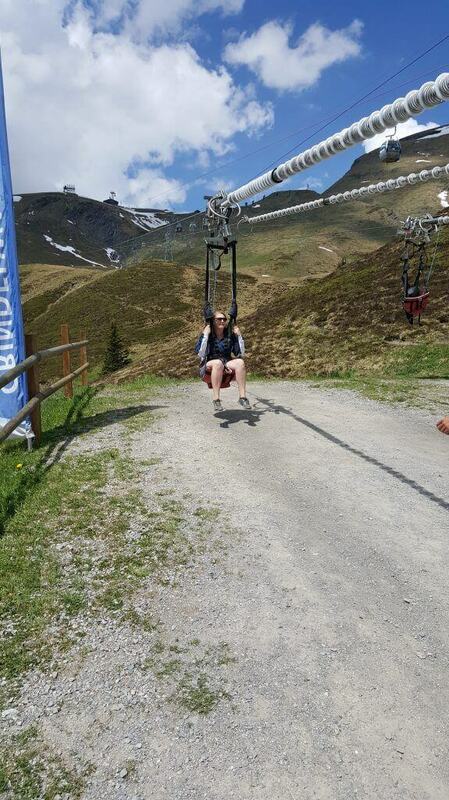 You can purchase tickets directly at the zip line, but note that the minimum weight is 35 kg or 70 lbs. My husband and I decided that I would do the ziplining and then my husband was going to do the mountain cart. 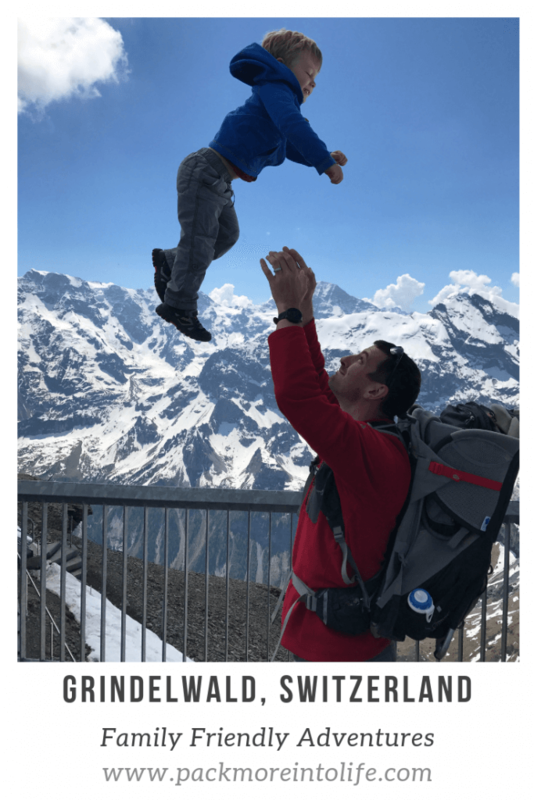 So while I waited in line and paid for my ticket, my husband and son headed down the lift down to the Schreckfeld lift station. They waited at the bottom to watch me fly! The zip lining was ok. It features an 800-meter long ride, reaching speeds of up to 84 kilometers per hour. I’m a thrill seeker and it made me smile, but my heart didn’t skip a beat. It did look fun for families with teenagers because you could all race to the bottom. 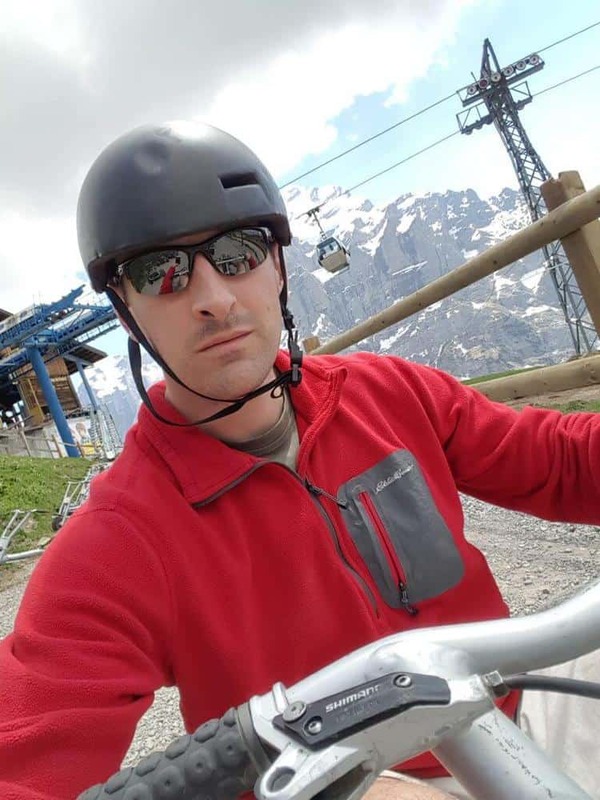 Once we were all reunited down at the Schreckfeld lift station, we switched parenting duties and my husband got to enjoy the next activity, Mountain Carting! If you kids are 135cm or taller, then they can enjoy the fun too. My husband said it was really fun to go barreling down the mountain (trying not to hit tourists) from Schreckfeld to the next station, Bort. My son and I rode the lift down to the Bort station and enjoyed the incredible children’s playground while we waiting for my husband to descend and return the cart. 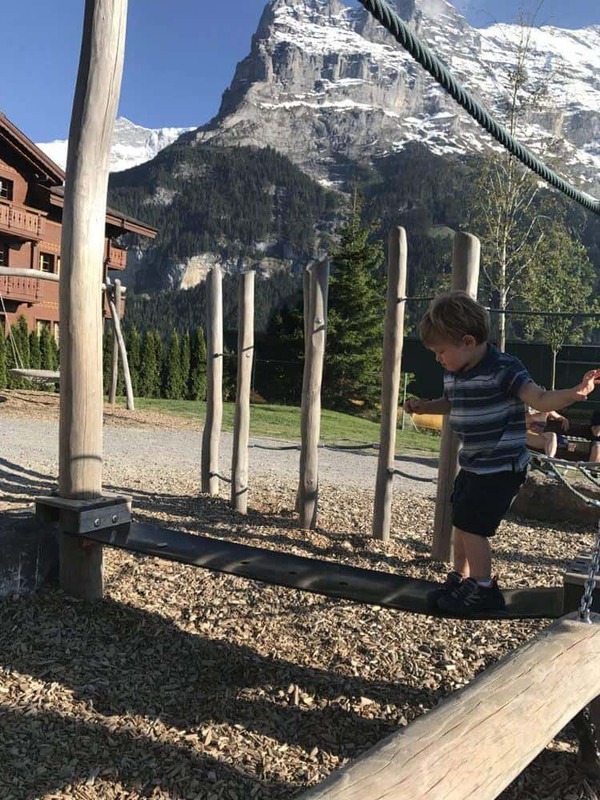 The Swiss certainly know how to make a playground. It featured tunnels, swings, paths to climb, ropes to crawl around and epic slides. Also, a great place to soak in the sunshine, the views, and some laid back family fun. As the day was pushing towards late afternoon, we headed back down the final lift to the town. Grindelwald itself is really nice. For children, there is a nice playground area as well as a mini-golf course. There are many wonderful restaurants (some featuring fondue) and most offer outdoor seating. There are also fun shops to poke around in and purchase amazing Swiss gear! Here are our favorite restaurants (especially with kids). Restaurant Memory: This is the downstairs version of the higher end Barry’s (which is upstairs). 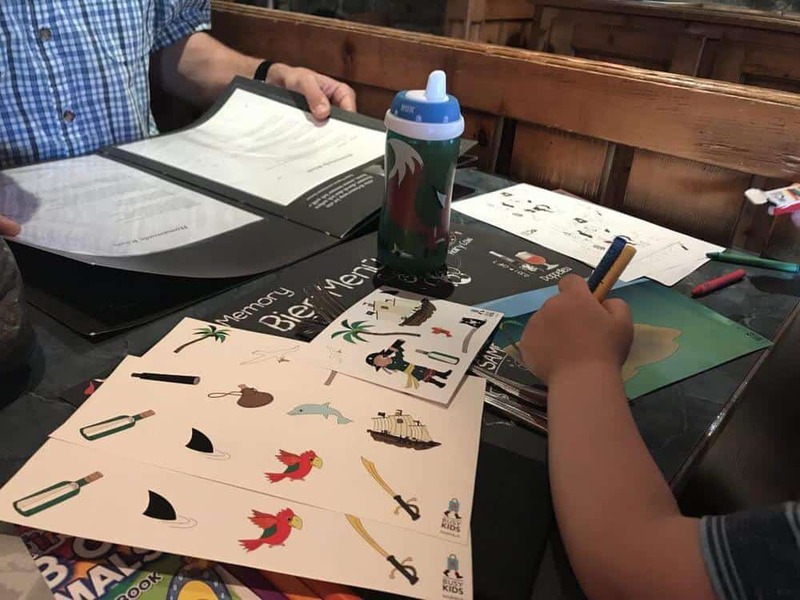 We liked this restaurant for it’s laid back feel, child-friendly menu and activity pack (crayons, coloring pack and activities). 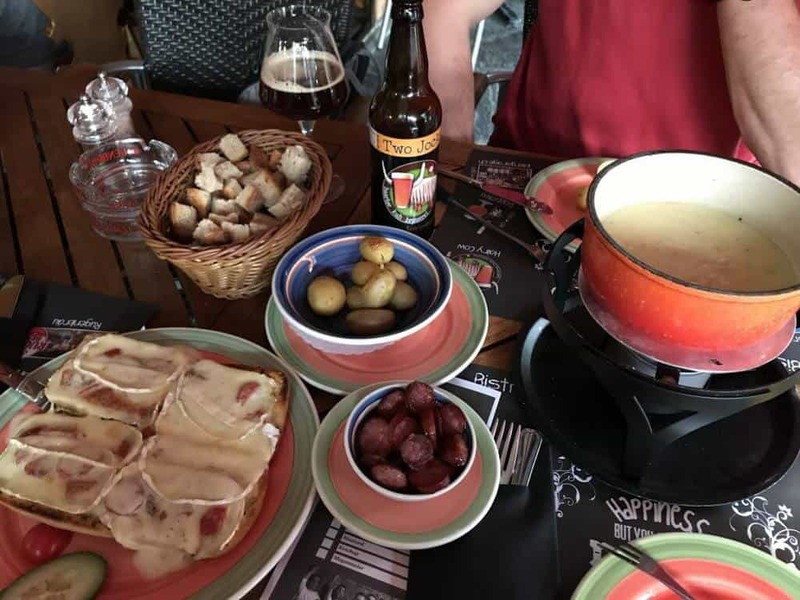 We enjoyed the fondue here and thought the portion sizes were quite large. My husband also enjoyed the beers and I enjoyed the salad bar. 2. Onkel Tom’s: We decided to get takeaway because the restaurant was really busy. Great pizzas and salads! We sure to make a reservation if you visit on a busy weekend because this place is popular! 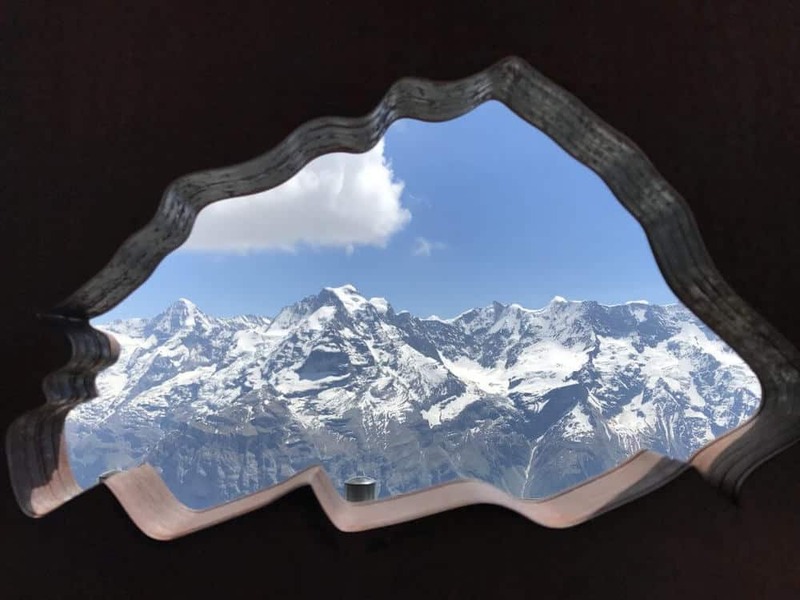 On our second full day, we decided to explore Murren and Schilthorn, Switzerland. 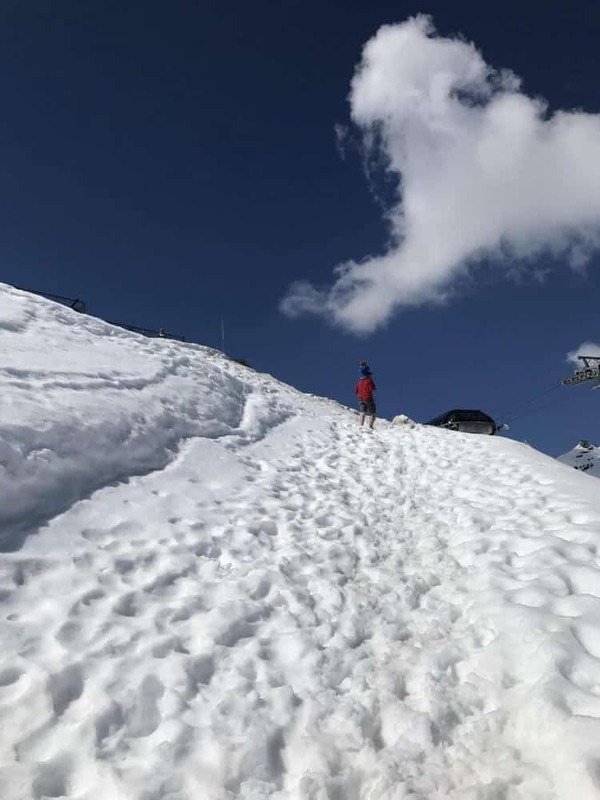 How to get to Murren? You’ll want to drive to Stechelberg and park your car at the base of the Schilthorn lift station. 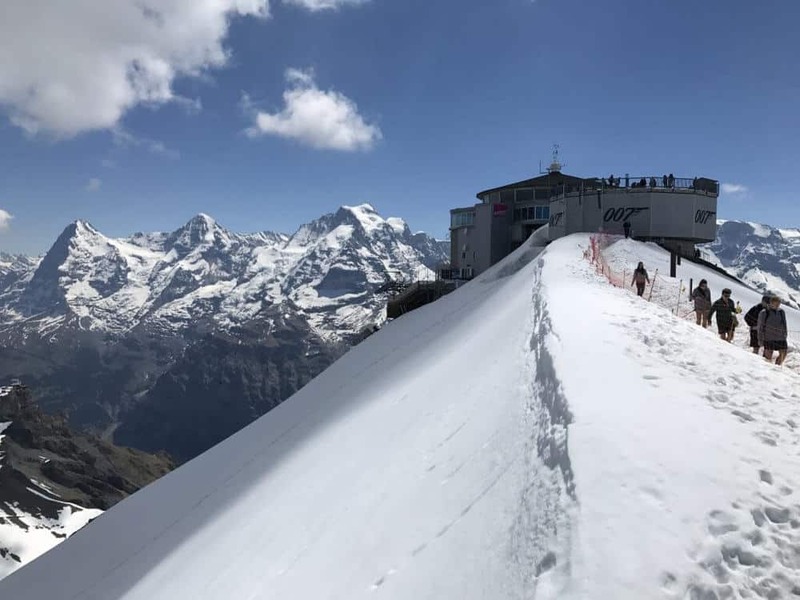 Purchase your tickets to either go just to Murren, or ascend all the way up to Schilthorn (featured in the 007 movie). 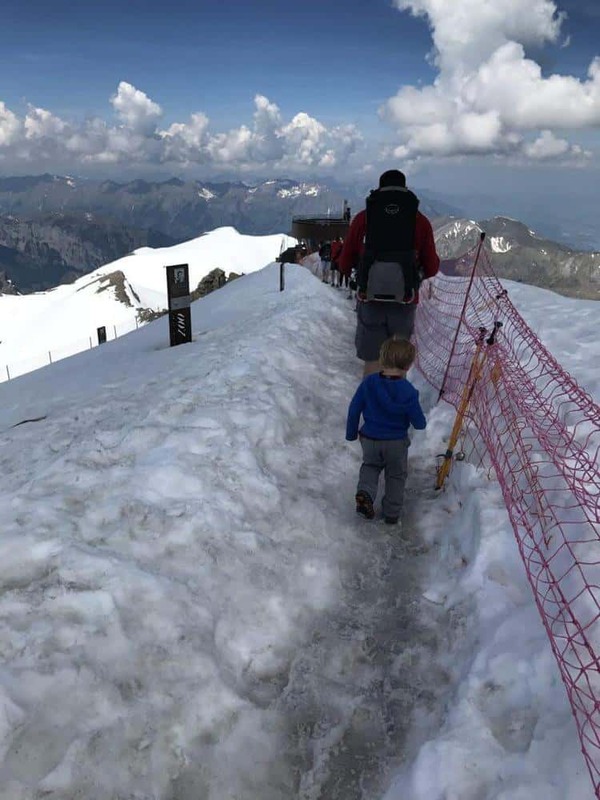 Our original plan was to explore the Children’s trail in Murren. 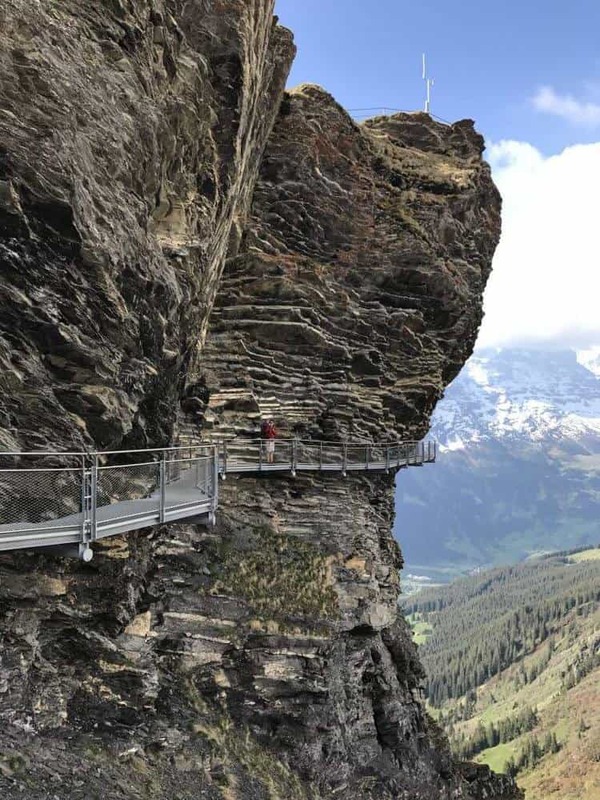 In order to access the trail, you’ll get off the lift at Murren and walk into the town. Murren is a car-free town, everyone that lives here has to use a lift system to get their goods up and down the mountainside. This makes Murren incredible peaceful and beautiful. Also great for kids because they are safe to explore a bit on their own. You want to look for the Allmendhubel funicular train (its located mid-way through the town). This is where our story runs into a bit of trouble. We got to the lift station and it was closed for refurbishment. OPS! 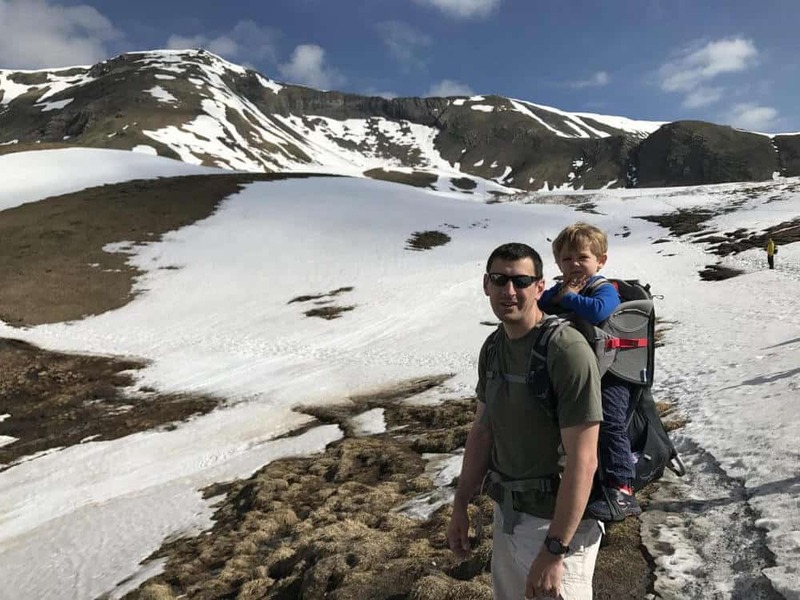 We thought about hiking up, but the hill was daunting, so check out this link (from another mommy blogger) to see the trail and what it offers, it looked like a lot of fun! Back to the drawing board! 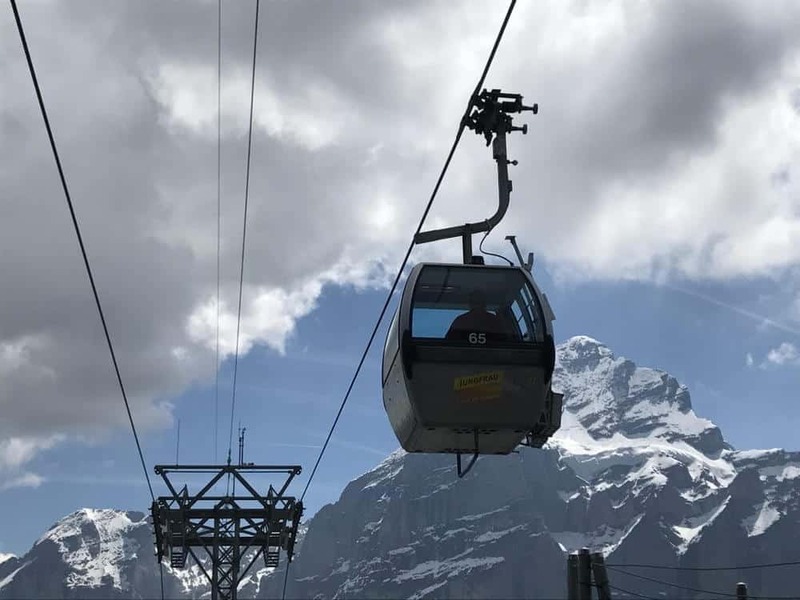 Since we were already 1/2 the way up the mountain, we decided to purchase tickets to continue up to the top of Schilthorn. Heading up the incredible lifts isn’t cheap, at just over 100 euros for adults (about 1/2 the cost for kids over 6), it’s an expense to consider, but I’m glad we took the plunge. This is usually our first stop because we can’t wait to check out the views. Of course, they were breathtaking! We lucked out with clear skies and you could see for miles. There are plenty of places to take photos and information boards (as well as on the glass railings). At just under 3,000 meters high in the sky, be sure to not overextend yourself or the kids. We grabbed a chocolate bar before heading over to the Thrill Walk. You can also trudge through the snow out to a second platform. Be sure to have the proper footwear and keep an eye on the little ones. We had a kids hiking carrier, but also let our little one explore the snow. Lots of slipping and sliding! We felt safe along the trail with the plastic guide fencing. 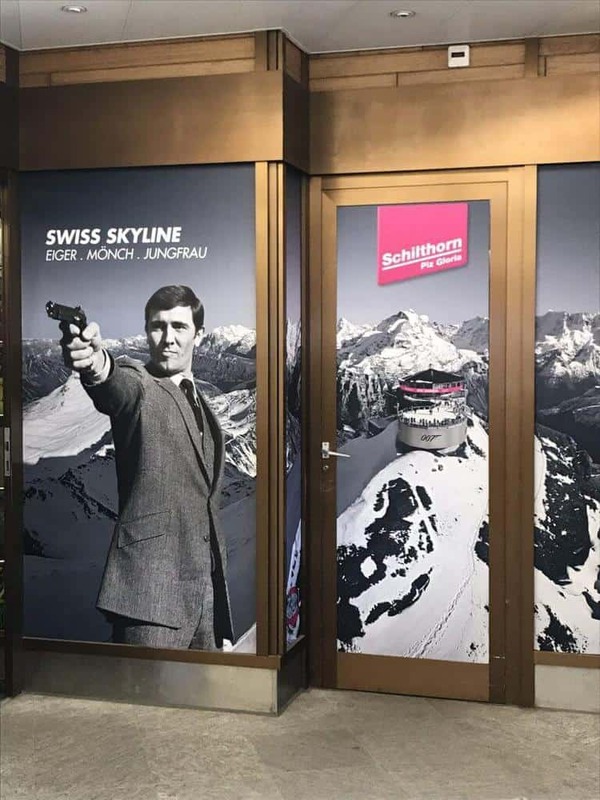 Schilthorn was the setting for the 007 movie ‘On Her Majesty’s Secret Service is 1969. This location was used as the hideout of Bond’s enemy Blofield. 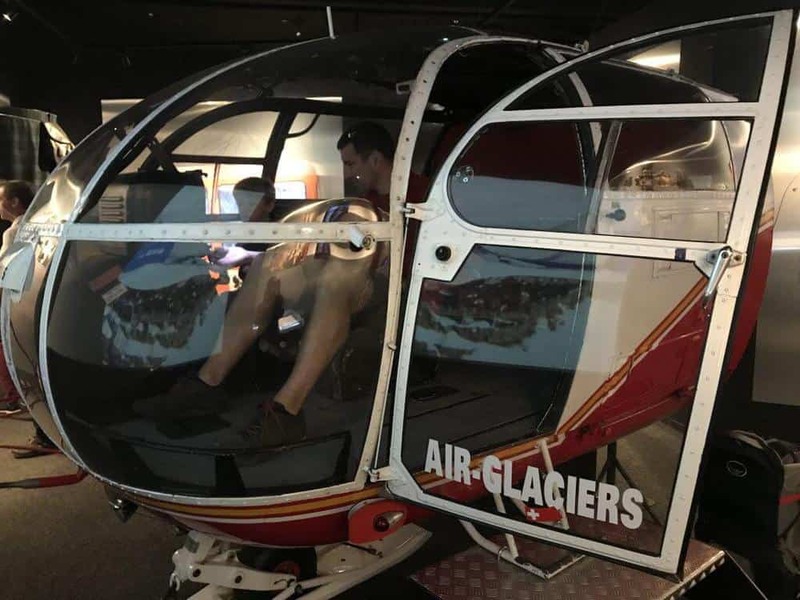 There is a fun exhibition featuring movie scenes, a full-size helicopter used in the movie (fun for the kids), interactive exhibits, information about how the film was shot and messages from the actors. Even though our little guy had no idea what the movie was, he still enjoyed wandering around and checking out the interactive aspects of the exhibition. 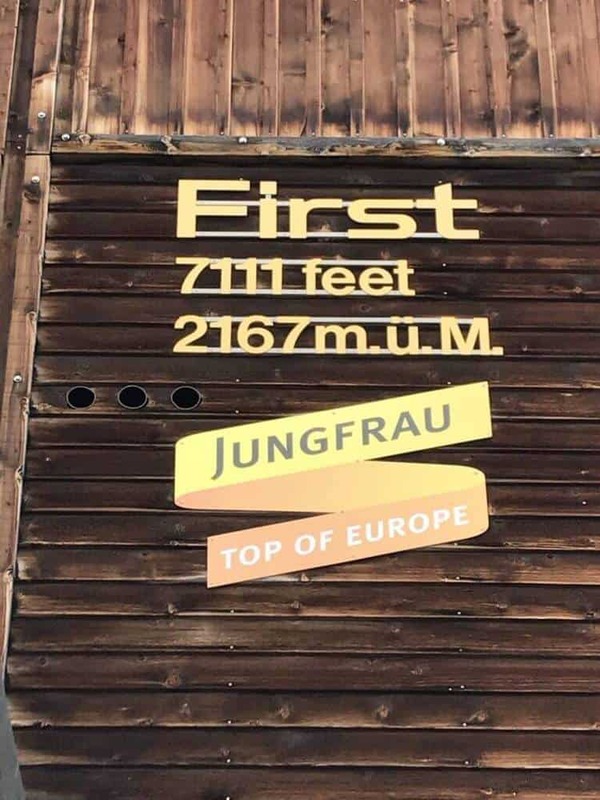 You’ll also see fun facts about filing the movie around the observations points, walking out to the second observation deck and inside the buildings. Take some fun photo ops! If you’re looking for high-class dining, check out the first ever revolving restaurant. Or, if you’re like us, grab a sandwich and a bag of chips at the cafe. Be sure to dress in multiple layers with a coat, sturdy boots and hats/mittens for the littles. Even if the weather is beautiful at the base station, you’ll be cold when you get up to the top. In late May, we were able to wear a fleece, boots, pants and had extras inside our bags for blustery weather. 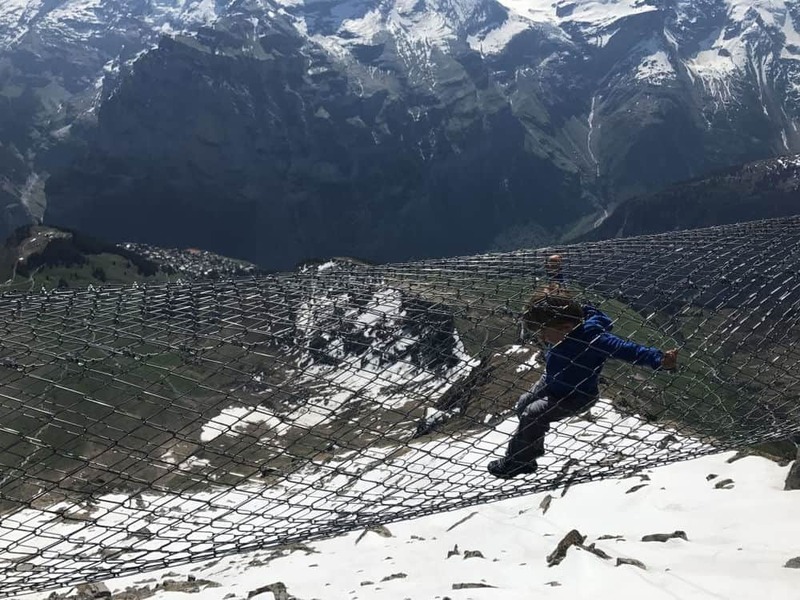 On your way down (or up) from the top of Schiltthorn, get off at the Birg middle station to explore the Thrill Walk. Feel like a mountaineer on this thrilling walk alongside the cliff. 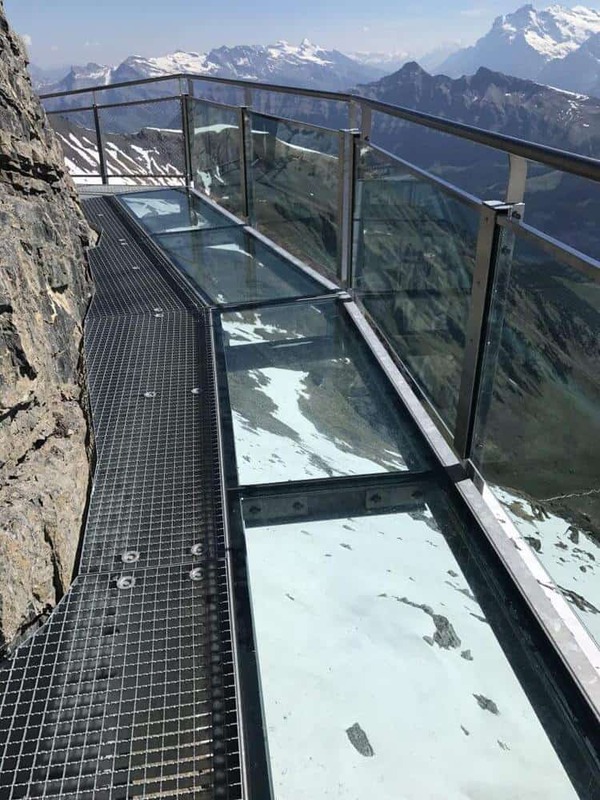 Peer down thousands of feet below through clear glass walkways or steep rope “bridges”. We enjoyed the walk almost on our own for the large majority of the time. Not for the faint of heart! As you can see, our little guy had no problems exploring all the fun “obstacles”. We felt like the Thrill Walk was easy to complete with kids and was perfectly safe. We also played around in the snow (snowball fight anyone) and took a detour to explore the snowy hillsides. I’m thankful my husband is a good sport and doesn’t mind carrying our little with all my crazy plans. Once you get back down from exploring Schiltthorn or Murren, enjoy the valley station for a little while. There is a cute little restaurant/cafe serving food and beer. There are a playset and sandbox for the kids. Our little one needed a nap, so we took the time to enjoy a break and watch the parasailers. We’ve learned that it’s nice to slow down a little bit and really take in the scenery, so this was a highlight for us. Across from the parking area is a small bridge over the stream and down to a beautiful free waterfall. It is one of many, but easily accessible. You may also catch a glimpse of the sweet Swiss cows that roam the valley enjoying the green grass. Ever wanted to see a waterfall inside a mountain? This attraction is beautiful. It is also Europe’s largest subterranean waterfalls. The Falls are also the world’s only glacier waterfalls that are reachable for tourists via walkways, stairs, bridges and more. It is a thunderous sound with 20,000 liters of water rushing past per second. 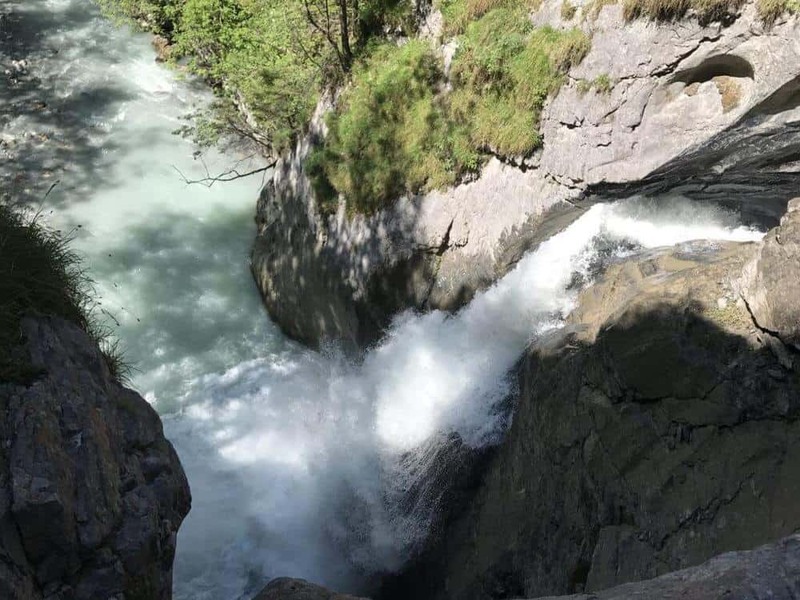 The Falls are located 20 minutes drive from Interlaken. About 5 mins after you leave the town of Lauterbrunnen, you’ll reach a large parking area (free) for the Trümmelbachfälle. Next, to the parking lot, you’ll find a self-service cafe with outdoor seating overlooking the valley. 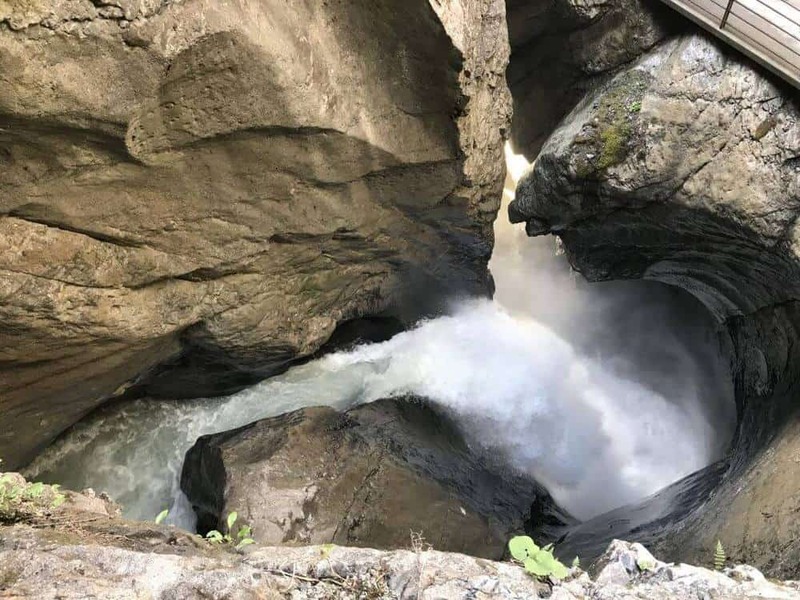 Make sure to use the toilets behind the restaurant as there are no toilets at the falls themselves. Open 9am-5pm. Even the fields next to the entrance were beautiful. Bring cash, the small ticket window only took cash. Tickets are 11 swiss fracs per adult and 4 swiss fracs per child. They DO NOT allow any children under the age of 4! This is not due to safety, but due to the loud noise inside, it’s thunderous. Once you’ve paid for your tickets, you’ll gather in a lift and enjoy a short ride up to the top of the Falls. From there, you’ll work your way down through the caverns back to the bottom of the valley. It is dark and wet inside the tunnels. Don’t even try to bring a stroller (they aren’t allowed) and a hiking carrier will be too difficult. Bring a soft structured carrier, but honestly, if your child is actually 4, you probably don’t have one anymore. Bring your hiking shoes to explore inside the cave. Marvel at the rushing water and enjoy it from all the various viewpoints. Towards the end, you’ll pop back out into the valley with the beautiful flowers and lots of steps. 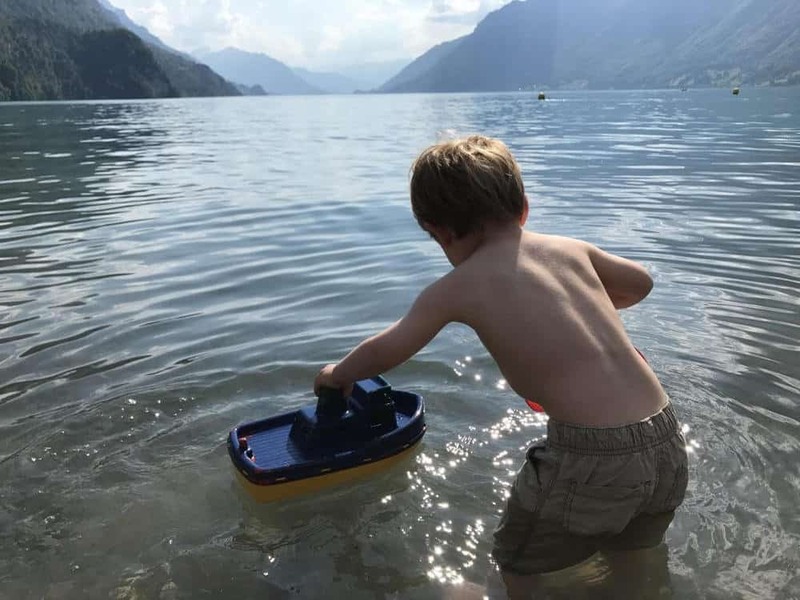 With a beautiful late afternoon and a toddler ready to explore, we decided to head down to Lake Brienz to find a place to play along the shore. There are a few options, but none are free. We drove along the edge of the lake searching for a fun little beach area to play without any luck. According to the google photos, there is a nice adult sized pool with a grassy area that also features a child-sized pool and playground structures down by the lake. Out floating in the lake are fun trampolines, water slides, and climbing structures. 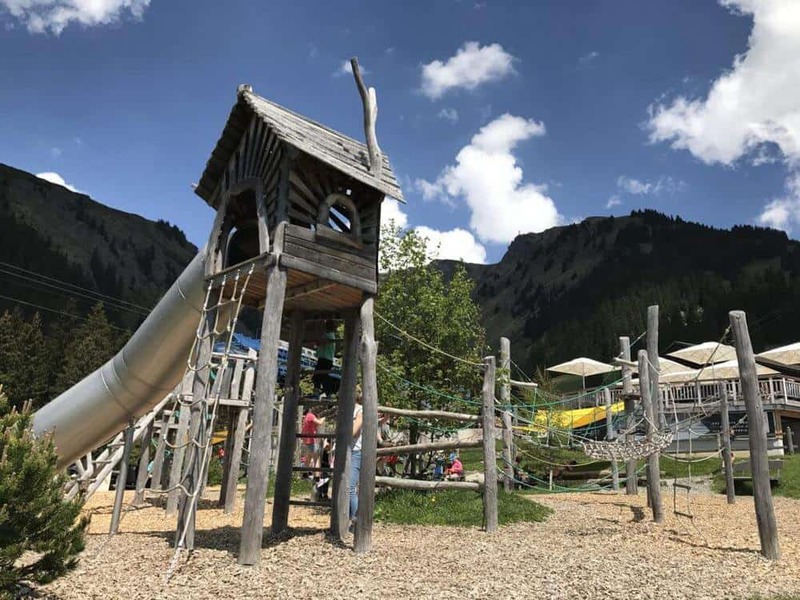 Option 2: The place we found doesn’t seem to have a location on google maps, so search for Restaurant Panorama (Hauptstrasse 216, 3855 Brienz, Switzerland) and then park in the little-paid parking area, head across the pedestrian bridge and you’ll see a cute lakeside play area. It features a kids pool, large swimming area, playground, rocky lake access and plenty of space to spread out a blanket and soak up the warmth of the sun. There were quite a few toys scattered around and it was certainly a locals spot to spend time together as a family. 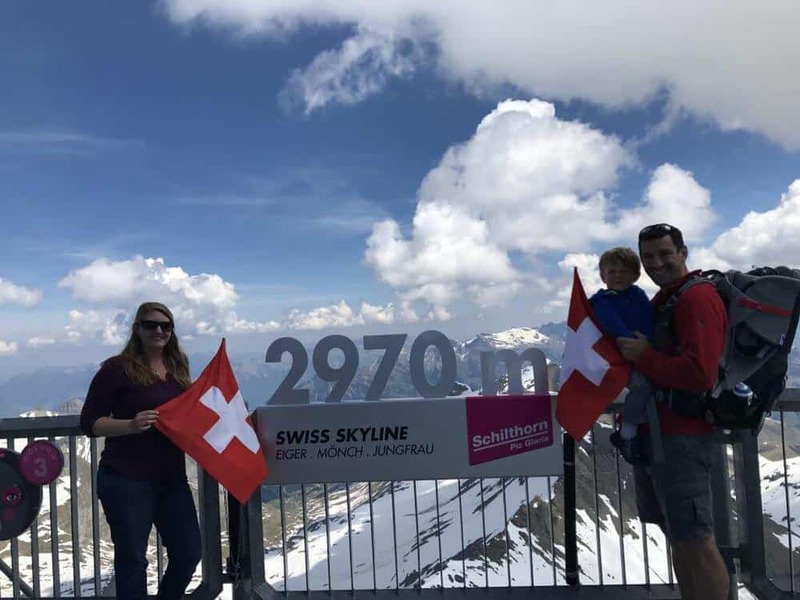 Switzerland is a favorite for our family and if it wasn’t so expensive, we would be frequent visitors. 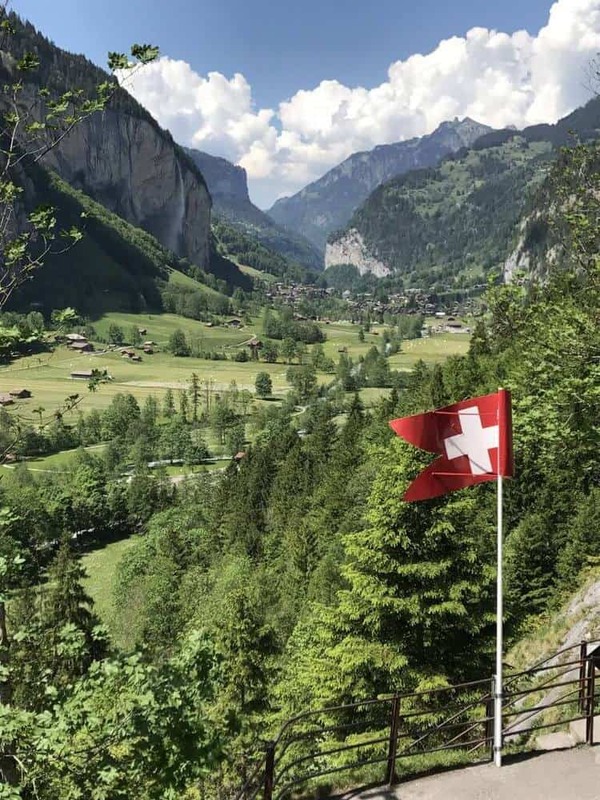 The Swiss are warm and hospitable, then transportation system is well connected and impeccably clean. The scenery is absolutely stunning and the surroundings offer a wide array of wonderful activities.